President Trump gave a very presidential speech Saturday afternoon in the wake of the mass shooting at the Tree of Life Synagogue in Pittsburgh. While shameless Democrats were busy exploiting the attack for political gain and accusing Trump of being a terrorist, he was bringing people together. The highlight was when he had a local Jewish rabbi and Christian pastor both give prayers. 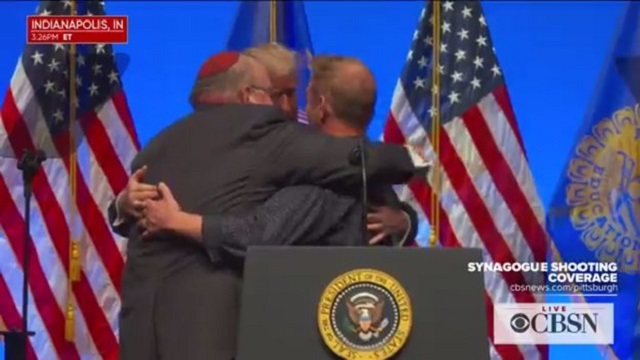 They both gave really nice prayers and then they had a spontaneous three-way hug. It was as presidential as it gets and such a stark contrast to the hate being spewed by the Democrats and the fake news media. Notably, Trump did not say he's going to take away our freedoms in the wake of the attack, but instead called for mass shooters targeting religious facilities to get the death penalty. Speaking to the Future Farmers of America in Indianapolis before his scheduled campaign-style visit to Murphysboro, Trump said he considered canceling the Illinois stop because of the Pittsburgh shooting. �You know, we can�t let evil change our life and change our schedule. We can�t do that. We have to go and do whatever we were going to do, otherwise we give them too much credit. We make them too important. And, you go with a heavy heart but you go. You don�t want to change your life. You can�t make them important. These are bad people. You can�t allow them to dominate what we do,� Trump said. �So, I�ll go. Not that I want to go. But I think I actually, in reverse, have an obligation to go,� he said. At least 10 people were killed and six others wounded, including four police officers, at a Pittsburgh synagogue Saturday morning. Trump recounted the opening of the New York Stock Exchange after 9/11, saying it happened quickly although it took six days.